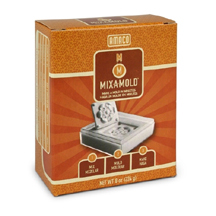 Mix-a-Mold makes it easier than ever before to make perfect reproductions of three dimensional objects. Mix-a-MoldTM is fast and fun and picks up every detail. Supplied in powder form, it mixes with water and the mold is ready in two minutes. Fill the mold with Sculptamold®, Casting Compound or any other casting medium.